Children whose mothers are exposed to high amounts of certain pesticides while pregnant appear to have lower IQs than their peers when they reach school age, according to three government-funded studies released today. THURSDAY, April 21, 2011 (Health.com) — Children whose mothers are exposed to high amounts of certain pesticides while pregnant appear to have lower IQs than their peers when they reach school age, according to three government-funded studies released today. The pesticides, known as organophosphates, are commonly sprayed on food crops and can be found in trace amounts on berries, green beans, and other fruits and vegetables sold in stores. The pesticides have also been used in homes and gardens, although their indoor use has been widely restricted due to safety concerns. Organophosphates, which kill pests by attacking the nervous system, have previously been linked to developmental delays and attention problems in young children who were exposed in the womb. Now, researchers in two different locations have found that a child's IQ tends to decrease in proportion to the mother's exposure while pregnant. One of the studies followed hundreds of mostly Latino mothers and children in California's Salinas Valley, a center of commercial agriculture. Many of the women were farmworkers, or had family members who worked on farms. "That's not unlike the decreases we see in children with high lead exposure," says the senior study author, Brenda Eskenazi, Ph.D., a professor of epidemiology and maternal and child health at the University of California, Berkeley. "It's equivalent to performing six months behind the average." The children's own metabolite levels were not linked to their IQs, however, which suggests that prenatal—rather than childhood—exposure is largely responsible for the trend, Eskenazi says. Organophosphates, which pass from the mother to fetus through the placenta and umbilical cord, may be more damaging to developing fetuses than to children, the study notes. Similar trends are likely to be found outside farming communities, the researchers suggest. While the average metabolite levels of the pregnant women in the study were substantially higher than the national average, as many as 25% of pregnant women in the general population have levels above the study average. Moreover, the findings are echoed by a second study released today, which was conducted in New York City and followed 265 black and Dominican mothers and children from low-income families. In that study, researchers measured levels of the organophosphate chlorpyrifos in the women's umbilical cord blood. Chlorpyrifos, which has since been banned for indoor use, was still commonly used as a residential pesticide when the women were pregnant. Using the same IQ test as the California study, the researchers found that when the children were 7, the IQs of those with the highest exposure in the womb was roughly three points lower, on average, than those with the lowest prenatal exposure. The joint findings are strengthened by the differences in the locations, study participants, and methods used to measure pesticide exposure, says Bruce Lanphear, M.D., a professor of health sciences at Simon Fraser University, in Vancouver, British Columbia. "Because the results are so consistent, we're more confident that the results are not spurious," says Lanphear, who was not involved in the research. In both studies, the researchers sought to cancel out other factors that can affect a child's IQ. They controlled for the mother's education and income, and observed the stimulation provided by the child's home environment. The California study also factored in the mother's exposure to lead and toxic flame retardants. Experts aren't sure how organophosphates might interfere with fetal brain development, although they do know that in insects the pesticides slow the breakdown of acetylcholine, an important neurotransmitter. "There have been a lot of studies that indicate that there are probably other mechanisms," says the senior author of the New York City study, Robin Whyatt, DrPh, a professor of clinical environmental health sciences at Columbia University's Mailman School of Public Health. Genes may play a role, in fact. In the third study, which also looked at children in New York City, researchers found that the association between organophosphate exposure and developmental delays was more pronounced in children whose mothers had a certain genetic variant that influences an enzyme that breaks down organophosphates. The three studies appear in the April 21 issue of the journal Environmental Health Perspectives. All three were funded by grants from the Environmental Protection Agency and the National Institute of Environmental Health Sciences, among other sources. The average exposure to organophosphates is lower today than it was when these studies began a decade ago. Now that the indoor use of organophosphates has been all but eliminated, the main sources are direct exposure to commercial agriculture and the traces found on supermarket produce. 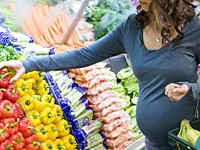 Eskenazi stresses, however, that pregnant women should not stop eating fruits and vegetables. "It's absolutely important that they have an adequate diet in terms of the health of their child," she says. Still, she adds, "It's important that people wash their fruits and vegetables really, really well—and that means even fruit with a peel on it. It should be washed before you peel it."